Love it or hate it the second season of “Jersey Shore” will debut tonight on MTV and quoting the network’s web site….”the eight housemates are back for another season of GTL, fist-pumping and battling grenades.” For those of you who do not watch or follow, GTL stands for gym, tanning and laundry which sums up the complex lives of these eight talentless individuals who have managed to carve out a nice living by being in the right place at the right time. Of the eight, six are from New York one is from Rhode Island and only Sammi “Sweetheart” Giancola is from New Jersey….Hazlet to be exact. I’m assuming there are quite a few of you who really don’t know much about this and frankly don’t care so this morning’s segment is your Readers Digest version of what this is all about. The reality TV show was filmed last August in Seaside Heights and frankly most people did not pay too much attention as cameras followed these eight people around the resort town. They lived and partied in a house near the boardwalk and actually had to work shifts in a t-shirt store, again often in relative obscurity. as far as viewers were concerned because the show became a hit, the cast members instant celebrities and Seaside Heights became known across the country. By the way there were only 9 original episodes but they garnered plenty of attention…so much so that the house near the boardwalk has become a landmark and tourist attraction. Earlier this year MTV announced that there would be a second season of “Jersey Shore” but it would originate from Miami Beach. Original plans called for 12 episodes with half of them taking place in South Florida and then the other half would be back in Seaside. By that point borough officials were back on board because they realized it just might be good for business. Anyway it turns out that there was enough Miami footage to get a full season of episodes and they begin airing tonight. Meanwhile the cast is back at the summer house in Seaside Heights and filming has begun for next year and reportedly they have a new cast member who is from New Egypt which I guess is about as close to the Jersey Shore as they’ll get. will feature a buffet dinner, beverages, dessert, cash bar, auctions and more…plus your $75 donation gets you chips to play casino games for prizes. Special invited guests expected to attend include football player turned announcer Tony Siragusa, ex-New York Jet Joe Klecko, former Devils hockey players Jim Dowd and Ken Daneyko, TV Anchor Jack Ford and author Mary Higgins Clark, who will be available to autograph books. Friday’s event is in memory of “Jo Jo” Procopio, who was a staunch advocate and supporter for the work Big Brothers Big Sisters does in Ocean County. It’s not too late to purchase tickets for what should be a great night of entertainment…call the agency at (732) 905-5349. The Jersey Shore Council-Boy Scouts of America will honor Vito Nardelli with their 13th annual Loyal Buffalo “Good Scout” Award next Wednesday (August 4th) at Six Flags Great Adventure. Nardelli is Executive Vice President and COO of OceanFirst Bank and there’s a good chance you’ve heard his voice on commercials that air on this radio station. A Wall Township resident, he is the former Chairman of the New Jersey State Chapter of the March of Dimes and President of the Jersey Shore Boy Scout Council. Among his affiliations are the New Brunswick Development Corporation, Catholic Charities, the New Jersey Chamber of Commerce and the Fordham University School of Business. Nardelli is a retired Lt. Colonel and JAG officer who served with the US Air Force Reserves. A pretty impressive resume for a man who oversees and directs all major bank business at OceanFirst. Next Wednesday’s program at Six Flags will help raise funds for the Jersey Shore Council which serves some 11,000 scouts and volunteers. For information you can call (732) 349-1037. Tis the season for Little League Tournaments and the road to Williamsport continues later this week for Toms River National. The Section 3 champs are one of four teams that will compete in the state tournament which begins Friday at Van Horn Park in Hamilton. Toms River National will play North Hunterdon National in the first game and West New York American faces Northfield in the double elimination tournament which sends the winner to the Mid Atlantic Regional in Bristol, Connecticut. The Toms River 11 and 12 year olds put on a hitting display in winning the sectionals last week…scoring 52 runs in winning all three of their games. The Manchester Township Little League hosted the Section 3 tournament and by all accounts did a superb job. The facility on Route 571 could be a future site for the state tournament. Meanwhile Berkeley’s bid for a Junior League sectional title came up just short as they fell to North Wall 9-5 in last night’s championship game at the South Wall Little League. Ortley Beach won the team title at last night’s 23rd Annual Seaside Park Lifeguard Tournament. Ortley Beach used victories in the Iron Man Medley and 1000 foot row to take control of the 8-team tournament as they beat out Surf City with Ocean Beach II coming in third. The event was held in ideal conditions and as in the past was sponsored by the Seaside Park Service Center, Sawmill Café, Surf Taco and B&B Department Store. As I’ve done for most of the past ten years I was a lane judge and I’m happy to report there were no incidents of any kind. In early June Rick Handchen was honored by his peers as the Ocean County Athletic Director of the Year but starting next week he’ll be working out of the area. Handchen is leaving Brick Township High School after many years to run the Athletic Department at Clifton High School. He’s making the move after the Board of Education eliminated his position which would have required him to return to the classroom. Handchen’s father Hank was the first-ever Athletic Director when Brick High School opened and it’s unfortunate he could not spend his entire career in Green and White. Good luck to a good guy! Today I would like to tell you how I spent my summer vacation which officially ended at 3:05 this morning when my alarm clock went off. Actually one of the highlights was not waking up to an alarm clock for nine straight days, counting weekends of course. For the most part my vacation was spent at the beach as my brother rented a house on the ocean in Seaside Park. He and his 3-year old son along with my sister and her 4-year old son were down for the entire week and I did get to spend a lot of time with them. I will say it was not always relaxing and it was another reminder of how difficult it is just getting little ones ready for a day at the beach with all the packing and planning necessary. However they also remind you that it’s sometimes the little things which provide great joy as my nephew Trevor would spend countless hours over the week collecting shells like they were some kind of treasure. For the most part last week I just took advantage of not being on a schedule. My wife and I rode our bikes on the boardwalk…I just got my mine fixed after not using it for years and it was great. We went to the movies twice….saw “Grown Ups” and “Inception” which are at the complete opposite end of the spectrum but we both good in their own ways. I was excited about being on vacation the same week the Mets were playing on the West Coast which meant I could stay up and watch their games. But the way they are playing all that does is make you fall asleep which I would do just about every night on the couch. A few times I woke up and would watch a movie I had not seen in a while…just the other day I stayed up until 4:30 in the morning to watch “Midnight Cowboy” with Jon Voight and Dustin Hoffman. I can’t believe that movie is 41 years old. Anyway it was a pretty good week with my wife and I celebrating our 29th wedding anniversary Sunday. I hit the beach by myself for a couple of hours in the morning but gave in to the flies. Later we joined many of our neighbors for a get together and dined on lobster…not a bad way to end the week and vacation. For nearly four decades Lucy Greene has been the heart and soul of the Toms River-Ocean County Chamber of Commerce. She has worked tirelessly as an advocate for the business community and at the same time has contributed much to the fabric of the area in which we live, work and play. Greene as Chamber President has championed causes which saved the naval base at Lakehurst from being closed and also changed the name of Dover Township to Toms River Township. Simply put she been a tremendous asset to the Chamber of Commerce as well as a wife, mother, grandmother and church leader. Toms River’s Jeff Frazier was hitless in two at-bats but gave his many supporters a bit of a thrill in last night’s Triple-A All-Star game in Allentown, Pennsylvania. The former South Indian and Rutgers star ripped a shot to deep centerfield in his first at-bat which was caught against the wall. The game was broadcast live on the MLB Network and the announcers made mention that Frazier had a large group of family and friends in attendance. He now goes back to playing with the Tigers Triple-A team in Toledo where he’s having his best season as a pro. By now you’ve obviously heard or read that a pair of sharks has been spending some time in the ocean around Seaside Park this week. Longtime Beach Patrol Captain Joe Gomulka told me yesterday that “shark” is the one word that keeps swimmers out of the water. He added that on days when rips and currents make swimming dangerous it’s hard to convince people to stay out of the water but just the mention of sharks and they gladly get out. Of course there is a much greater chance of a drowning than a shark attack. Leave it to George Steinbrenner to upstage the All-Star game. The news around here was dominated by Steinbrenner’s death Tuesday after suffering a massive heart attack in Tampa, Florida at age 80. It was ironic that he would pass away suddenly on the day of the All-Star game because the longtime Yankee owner was known for making moves that would get him on the back-pages of New York newspapers, often stealing headlines from other sports stories. His death however was front page news as Steinbrenner was one of the most influential sports figures in my lifetime. Love him or hate him he was motivated by winning and spared no expense in building the Yankees into the most successful and admired franchise in all of sports. By the way I did hear many interesting stories about George yesterday. He was famous for firing managers with Billy Martin fired and hired five times by “The Boss.” However that’s nothing…he hired and fired a longtime team photographer 17 times. Steinbrenner was never afraid of dying from a heart attack…he said I don’t get heart attacks…I cause them. Since major league baseball is still in its All-Star break you might want to check out tonight’s Triple-A All-Star game which will be televised live on the MLB Network from the home of the Lehigh Valley Ironpigs, the Phillies top farm team. I mention this because Toms River’s Jeff Frazier will be starting in the outfield for the International League All-Stars after having an outstanding first half for the Toledo Mud Hens. The 27-year old has 15 homers and 48 RBI’s while batting .273 for the Tigers Triple-A club. Frazier took part in the home run derby on Monday night and finished 4th among the eight participants. An eyesore on Route 37 East in Toms River has been replaced by a sprawling contemporary car dealership which officially celebrated its grand opening Tuesday. Toms River Mayor Thomas Kelaher, Ocean County Freeholder Joe Vicari and Toms River-Ocean County Chamber of Commerce officials were among those attending a ribbon-cutting ceremony at Pine Belt Nissan which has moved into a building that was under construction nine years ago when it was destroyed by a fire. The new Pine Belt location is a welcome sight and great improvement to the area. Best wishes to Lou Trebino and David Sickel in their latest automotive venture. Now that the World Cup is over what did we learn about soccer in the United States? First and foremost is that mainstream sports fans will get excited when the U.S. is playing with a competitive team as we saw over the first weeks of the month-long event. However we are not nearly good enough to play consistently with the top countries and frankly most people will not care about the World Cup if we’re not any good. To me it’s almost like hockey in the Olympics…if the US is not a contender then not too many people are going to really care. Where soccer gets a bit of an edge is that the ethnic make up of our country results in many getting excited about the fortunes of teams like Italy, Mexico, England and more. However the future of soccer in this country remains tied to the future success of teams that wear the red, white and blue. If you are a Yankee fan than hearing Bob Sheppard’s voice was as reassuring as looking at a lineup with names like Mantle, Berra, Ford, Maris, Munson, Jackson, Guidry, Jeter, Pettitte, Rivera and many others. His first game as the Yankees public address announcer was April 17, 1951. That was Mickey Mantle’s first opening day in pinstripes and Joe DiMaggio’s last. From that day until September of 2007 his voice was what you heard when sitting in Yankee Stadium and Sheppard saw and called it all. He was also the PA announcer for the football Giants for 50 seasons and called other sporting events as well but certainly he was best-known when it came to baseball and the Yankees. Now the man called “The Voice of God” has died at the age of 99 although you might want to believe he’ll be introducing Mantle and DiMaggio again in a big ballpark above. If you drive by football fields at Toms River East and Matawan this week you might be surprised to see players practicing in the heat of mid-July. That’s because its U.S. Army All Shore Gridiron Classic week with the 33rd annual All Star game set for Friday night at Matawan High School where Huskies Coach Joe Martucci will be in charge of the Monmouth County team. Charlie Diskin of Toms River East is the Ocean County head coach. Matt Harmon, Ed Sarluca & I will broadcast the game on our sister station, 105.7 The Hawk beginning at 7pm Friday. get excited when the U.S. is playing with a competitive team as we saw over the first weeks of the month-long event. However we are not nearly good enough to play consistently with the top countries and frankly most people will not care about the World Cup if we’re not any good. To me it’s almost like hockey in the Olympics…if the US is not a contender then not too many people are going to really care. Where soccer gets a bit of an edge is that the ethnic make up of our country results in many getting excited about the fortunes of teams like Italy, Mexico, England and more. However the future of soccer in this country remains tied to the future success of teams that wear the red, white and blue. #23 jersey. Meanwhile the owner of Lebron’s former team ripped him to shreds publically and vowed to do everything possible to win a championship in Cleveland before the self-titled former “King” wins one. Dan Gilbert called James’ decision “a shocking act of disloyalty from our home-grown chosen one.” The city has not won a major sports title since 1964 and it does not appear that streak will end anytime soon. It was a homecoming of sorts for former Toms River East baseball standout T.J. Baxter Thursday night. The 24-year old designated hitter plays for the Delmarva Shorebirds, who opened a 5-game series at FirstEnergy Park by beating the BlueClaws 5-1. Baxter went 0-4 with a pair of strikeouts in his first game since being hit on the shoulder by a pitch on June 20th. He is in his third season with the Orioles organization after being drafted out of the University of New Orleans. Baxter is hitting .254 this season with 24 stolen bases. Thursday and indicated it’s just a matter of coming up with a time to formally announce his plans to play for the new Pirates coach Kevin Willard. There has never been anything in sports quite like the Lebron James Sweepstakes which will end tonight with one winner and many losers. The easy thing to say is that the entire affair has been a bunch of overblown hype typical of the times we live in and normally I would be in the group that feels that way. However this is a story deserving of all the time and attention….well at least most of it, because it will determine the future of several teams, fans and even cities. Businesses around the Quicken Loans Arena have prospered. With apologies to Drew Carey it’s Lebron James who has made Cleveland rock. So now at age 25 and in the prime of his career James has a chance to stay in Cleveland or head to several teams who overnight would not only become championship contenders but the hottest ticket in town. Reports this morning indicate he is likely headed to Miami to join forces with Dwayne Wade and Chris Bosh…the trio would make South Beach hotter than hot. Of course fans of both the Knicks and Nets are holding their breath and hoping that James might be headed in their direction. He would instantly resurrect pro basketball at Madison Square Garden and make Knicks games the greatest show on Broadway. As for the Nets, he would give the franchise something it really hasn’t had since Dr. J and of course would get to open a new arena in Brooklyn. Bottom line here is James is a franchise-maker and his announcement tonight will have an impact for years to come…a positive one on the team he chooses and a negative one on the cities who miss out. I don’t know if everyone feels the same but I know that as I get older time seems to move so much faster. I don’t mean in terms of hours and days but rather years which just seem to fly by. My wife and I were sitting on the beach this past weekend by ourselves and reflecting back on past summers and wondering just where the time went. Did it not seem like just yesterday when a day at the beach included multiple trips carrying playpen, umbrella, sand and water toys and more? We thought back to the summer just before Brandon’s first birthday when my regular routine was to walk along the shore with him on my shoulder when it was nap time. He would usually fall asleep after a few minutes and we would then lay him down in the shade. We knew that first summer he was a “beach baby” and watched him grow up on the 2nd Avenue beach in Seaside Park. and then boogie boards and skim boards. In looking back we smiled when thinking about Brandon, at about age 8 carrying his boogie board bag complete with gear and preparing for a long day in the water. He and his friends could spend hours catching waves…you’d have to force them to come in for lunch. Ironically at just about the time he was pretty independent at the beach we had a baby girl who was dipping her toes in the water for the first time so that entire process started all over again. The one thing for sure was that there we no quiet days at the beach and it was never simply just grabbing a chair, towel and book and heading out. It was always a case (at least for my wife) of preparing from diapers to lunch to toys and snacks to sunscreen and extra bathing suits. I thought about all of that this past weekend as the two us sat quietly on the beach by ourselves. Brandon, who will be 25 next month was in Belmar with friends and 18-year old Alex was working. We used to say how much we were looking forward to being able to read a book without being disturbed but I kind of envied the Moms and Dads who were busy filling pails with water and putting sunscreen on their kids. Time really does fly as you get older. the beach and in the water then I did on Sunday when west wind conditions kept most people as close to the shoreline as possible. While the heat may not be welcome by all it’s been very good news for local towns who have raked in increased revenues in the form of beach badge sales and of course parking meters around the beaches. They should have no complaints and are way ahead of last year with the summer tourism season now in full swing. Since I’m wearing a pink shirt today I’m going to admit to something that seriously might question my manhood to some. Yesterday I saw the third edition of the Twilight Saga, Eclipse with my wife and daughter. They did not drag me to the movie nor did I drag them…it was sort of in the middle. I had watched the first Twilight movie on DVD a while back and actually thought it was pretty good. I had not seen the second one, “New Moon” but my wife had and she wanted to catch Eclipse this weekend. So after three straight days at the beach I decided to skip the surf and sand Monday and watched New Moon at home and then went to the Marquee Cinema in Toms River with both my girls in the afternoon. I found myself surrounded by mostly young girls but fortunately found a friend (my age) who was with his wife and daughter. We vowed not to tell anyone we saw each other and I will keep him anonymous but I’m out of the closet. I thought this was the best of the three movies with some great action scenes. As for the “Team Edward” or “Team Jacob” stuff….give me a break. Jake has it all over that pale-faced vampire. It’s been quite a while since Jim Kiraly has been in his own home…actually his current residence is a Care One facility in Jackson. A longshoreman by trade he has spent the last 14 months dealing with cancer and the physical setbacks that often come with fighting the disease. It all started on Good Friday in 2009 during which Jim and his family participated in the Lakewood Elks annual fish fry. He, his wife Denise and high-school aged children, Cindy and Jim Jr. were regulars when it came to cooking at Elks Lodge #1432 and often they would even by joined by Jim’s parents. The time and effort did not go unnoticed and Kiraly received the 2008-09 Elk of the Year award. Anyway back to last year’s fish fry in which the burly motorcycle enthusiast was complaining about pain in his hip which sent him to the doctor a few days later. The diagnosis was multiple myeloma, a cancer of the plasma cells in bone marrow. Trips to Robert Wood Johnson Hospital for radiation and chemo were trying on both Jim and Denise. Eventually he began losing weight and his hair and would be admitted to the hospital where he suffered a series of set-backs, including viruses and an infection. Treatments made his bones so brittle that he both broke his shoulders while simply trying to sit up. There has been a ray of hope in the form of stem cell transplant therapy which has improved his numbers and outlook and Big Jim appears to be making progress. However just a few weeks ago a power outage near his home resulted in the water pump being damaged beyond repair. During this time the family has been getting their water from a hose connection to a neighbor’s house. For all he has done on behalf of the Lakewood Elks they and Jim’s many friends would like to give back. A benefit will be held on Saturday, July 10th at the Bayville Elks Lodge on Route 9 beginning at 4pm. The event will feature a buffet dinner, beer, live music, giveaways and more. All proceeds will benefit the Kiraly family and advance tickets are $30. For information you can stop in or call the Lakewood Elks Lodge on Kennedy Boulevard…the number is (732) 363-9572. 21 Plus was been around for more than thirty years but there’s a pretty good chance you’re not familiar with them. The organization was formed by a group of parents of children with developmental disabilities who were frustrated by the lack of available programs once they reached the age of 21. Over the last three decades the organization has grown tremendously as has the need for their services and currently they provide opportunities for almost 150 adults in Ocean County. They operate several group homes and apartments, have an adult training center as well as a supported employment program and just last year added in-home and out-of-home respite services. I tell you this because on Monday, July 19th the 21 Plus Foundation will hold their 4th annual Golf Classic at Eagle Ridge Golf Club in Lakewood and I will serve as Master of Ceremonies for the awards dinner afterwards which will also include an auction. Among the items to be auctioned off are golf foursomes, Yankees tickets and tickets to an HBO premiere in New York. 21 Plus at (732) 240-3118 or visit their website at www.21plus.org. The Manchester Township High School Class of 2000 is holding their 10-year reunion on Saturday evening July 10th at the Quality Inn of Toms River. To purchase tickets visit www.sendomatic.com/mthsreunion. Millennium Radio’s Shore Sports Network will be the home of Monmouth University football for the next three years. We have reached agreement with the school and Nelligan Sports Marketing on the multi-year extension to broadcast the Hawks games on 1160 WOBM and Shore Sports 1310. Monmouth football was broadcast on the Shore Sports Network for the first time last fall. 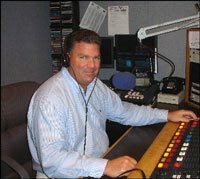 Matt Harmon, the play-by-play voice of our high school sports programming will once again broadcast the games with fellow Hawk alum Ed Occhipinti. All you need to know about how far the New York Knicks have fallen is the fact they are not considered one of the front-runners to land free agent mega star Lebron James. Most experts feel the New Jersey Nets have a better chance of getting King James which is really sad…if you’re a Knicks fan. what will take place Sunday in Beachwood truly defines America’s birthday and the spirit of volunteerism. Times may have changed but for the 70th year young and old will gather in Beachwood and towns along the Toms River and culminate the holiday by watching fireworks. Many have planned their day around the spectacular and by dusk tens of thousands will be ready to “ooh and ah” from land and water. Most have no idea who pays for the show and just assume it will take place year after year because that’s the way it’s been. However if you don’t know this is an effort fueled by volunteers and the borough of Beachwood, which coordinates the effort through its Public Works and Police Departments. It started in the 1930’s and for many years the fireworks were launched by members of the Beachwood Volunteer Fire Company. While they are still on hand to assist Schaefer Pyrotechnics is contracted by the Fireworks Committee to handle the shoot and this takes money….quite a bit of it. which splatters all over everything, including my clothes. I can’t decide what was worse….having to clean up my clothes and my office or not having the coffee to drink. I mean I can smell that great aroma since it’s all over everything but I can’t taste it…it’s almost a form of torture. I also worry if this is an indication of the kind of day this is going to be. Only time will tell on that one. Okay I will admit to being a front-runner. When the US was alive in the World Cup I was pretty interested in the soccer tournament that is held every four years. Now that we are out it just does not have the same appeal although I will glance at the TV from time to time when games are on. After watching teams like Germany and Brazil the Americans still have a long way to go to play at that level. A bit closer to home….the Jersey Shore baseball team is just a win away from claiming the Carpenter Cup for the third time in the 25-year history of the Phillies-sponsored event. Toms River South’s Andrew McGee continued his dominant pitching to help Jersey Shore blank defending champion Burlington County 4-0 Monday at Citizens Bank Park. McGee threw 3 hitless innings and struck out 9 yesterday and for the tournament the Monmouth University-bound lefty has 17 strikeouts over 9 shutout innings. Jersey Shore will play in the championship game Wednesday afternoon at the Phillies ballpark with their opponent to be determined later today. Meanwhile in the Carpenter Cup Softball Tournament, Jersey Shore has also advanced to the finals after beating Olympic Colonial 2-1 at Franklin Delano Roosevelt Park in Philadelphia. Jordan Weed of Toms River East pitched the final three innings to secure the victory.